HP Velotechnik was founded by Paul Hollants and Daniel Pulvermüller in 1993. Its production site in Kriftel near Frankfurt employs 35 people (including four trainees) and manufactures approximately 2,000 recumbents per year, making it the European market leader. The bikes are individually built to order by hand and sold via specialist bike dealers. 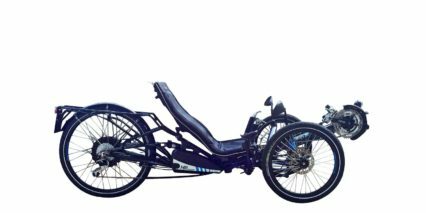 Signs of growth are evident: The recumbents are sold in Germany and Europe; increasing numbers are also being exported to more distant regions such as U.S.A., Australia, and Japan. HP Velotechnik has developed 14 recumbent models across the entire class spectrum from everyday bikes to racers. All models are available with powerful electric motors on request. Recently, the fullsuspension trikes of the Scorpion class won three times in a row the renowned Eurobike Design Award: In 2012 the speed pedelec Scorpion fs 26 S-Pedelec, in 2013 the mountain trike Scorpion fs 26 Enduro. and in 2014 the SUV trike Scorpion plus 20. The second trike models line up, the Gekko, has achieved in 2011 the Eurobike Design Award in Gold. Its folding technology is patented pending to the German Patent Office. Even as students, the company founders Hollants and Pulvermüller were national champions with their cabin trike in the Association of German Engineers’ 1992 JUTEC youth and technology competition. This provided the foundation stone for their development from a garage laboratory to one of Germany’s most innovative bike companies. During the last ten years, HP Velotechnik was repeatedly named as one of Germany’s three best bike manufacturers by the bike industry association VSF.